Vee-Jay was founded in Gary, Indiana in 1953 by Vivian Carter and James C. Bracken (later that year, Mr. & Mrs. Bracken), who used their first initials for the label’s name. This black-owned company was very succesful (Vee-Jay was the first US label that had the Beatles) but went bankrupt in 1966. In the 1970’s the label revived as Vee-Jay International (excluded from this discography). Vee-Jay 857 is a reissue of #137 (Rev. James Lofton). 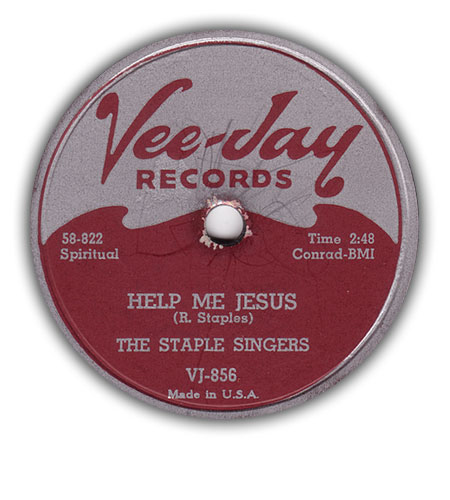 Vee-Jay 885 has been released as by the Staple Singers and as by Roebuck Staples. Vee-Jay 869 is a reissue of #232 (Swan Silvertones). William Everett Preston (Vee-Jay LP 5083) is Billy Preston. Vee-Jay LP 8503 (various: Black Nativity) is a reissue of LP 5022. Vee-Jay LP 5056 (Alex Bradford) was reissued on Checker LP 10092. Missing numbers are secular (100 & 200 series), the gospel 800 series starts with #843 and continues to #969, with no missing numbers. Early numbers in the 800 series (800-808?) are secular and released in 1966. I guess, in 1966, Vee-Jay wanted to release the yet unused numbers in the 800 series (800-842) but bankruptcy frustrated these plans at an early stage. This page lists all known Vee-Jay gospel issues from 1954 to 1966.